Does your business need to track staff and guests coming and going from your building? Are you concerned about a security breach if an employee suddenly leaves the company or misplaces their keys? 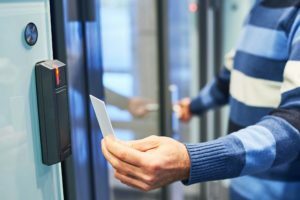 Bulldog Fire and Security can help you develop an access control system that is scalable and customized to your needs. Bulldog Fire and Security has the ability to install and service an access control system for a wide range of facility sizes and complexities. Our certified Customer Service Representatives will work with you to determine you needs and develop a system that is easy to use and will fulfill your needs. All of our system installations will include training when the system is installed. We have the ability install systems in single or multiple buildings, which can all be managed through a single software program. This software program will allow you to manage your access permissions through multiple buildings simultaneously. 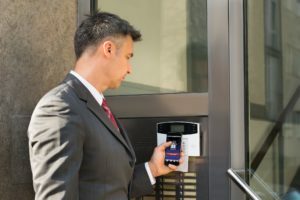 Historically, it is typical for card access control systems and its data to be hosted on site in a computer or server. In this circumstance, if you’re not regularly backing up your data, it can be lost in the event of a computer failure. Bulldog Fire and Security can host your access control system off site in our secure data facility to ensure that it is always available and secure. The system’s information can be updated in real time and you will be able to access it from anywhere and at any time with an internet connection. With this system, you will be able to grant permissions, program schedules, add and remove users all from your computer or smart phone app. Hosted Access Control is a great solution for managing multiple sites as each site can be accessed through one user interface. Bulldog Fire and Security will customize a solution for you using a variety of technology levels including traditional cards, access fobs, and swipe cards. We are also able to work with biometric readers adding an additional level of security through handprint, fingerprint, or optical readers.